A few more still life paintings to complete and then I’ll be moving on to my favorite subject, landscapes. I was in the mood to paint a bright scene that mimics a bit of the rough Tex Mex’s we have in Texas – where the establishments might look a bit worn, but the food is the best! This oil pastel (8×6) was a combination of elements in three photographs and my imagination, the rough textured back wall resembles walls that are often found in old Tex Mex restaurants. It was painted on textured cardstock paper. Sorry my hand shock some when taking the photograph, the painting is a bit crisper than what’s showing here. Hope you are having a great day – I’m going out to tend to the gardens today, things have been a bit neglected because of the cold temps we’ve had this winter and I can’t put off cleaning the beds. This entry was posted in About Oil Pastels, OPs New Paintings and tagged limes, Oil Pastel, painting, pepper, salt. Bookmark the permalink. What a great composition, Mary! I’m ready to pull up a chair for lunch;) Love the contrast between the clean sharp elements and the contrasting texture in the back round, not to mention the color. Hi Elena, thank you very much! So glad you liked the piece – all ready for avocado. So wonderfully done Mary. Loving all your textures and beautiful colors. Thank you very much Rhonda for your nice comments! Thanks for mentioning the textures, they are much heavier in person than what I’ve been able to show with my photograph. That is a true Tex-Mex atmosphere captured, Mary! So funny Marina – weeds and leaves never stop! Thank you, this was a fun, just do it kind of painting. Lemon chilli and salt.. I bet you are going to introduce the tequila any minute now.. great to see your work any time and hope the gardening was easy enough. Thanks Doron, nice to see you – hope you’re on the mend. Thank you very much for your nice comments, I missed putting that bottle of tequila – great thought! Perhaps one day, I’ll do another on this theme. Look forward have a great weekend hope warmer too. there’s nothing like the therapeutic work of pulling weeds to balance with meticulous attention to painting! i laughed about the hand shaking – it’s often difficult to photograph art, isn’t it?! the image looks great,and you continue to present amazing posts.. oh boy, it’s wednesday, which means that we’re going to have another lovely swim through the calming magic of your pencil! Ah Z, hope you are well. Thanks and you know I worked on this piece off and on for the last several days as I just couldn’t get the “ah-ha” feel, and then adding the salt brought it together. Yes, can’t wait to get my pencils out and work on Sorrow. Any bed tidying now will be worth it in the coming weeks … well … that’s what I’m hoping for too . Thank you so much Poppy. It was a nice change of pace painting a piece that is so far from my norm. I have several more and then “ah” back to wandering landscapes! But what is that fiendish-looking tool there, Mary …? Hi M.R. it’s a chili pepper – these little guys bring a whole lot of heat to a plate! the textures are so reminiscent of little mom and pop places i’ve been in too. using the card stock was a brilliant idea. Thanks so much – I thought it might be fun to liven the piece up a little, ah but I forgot the tequila bottle! 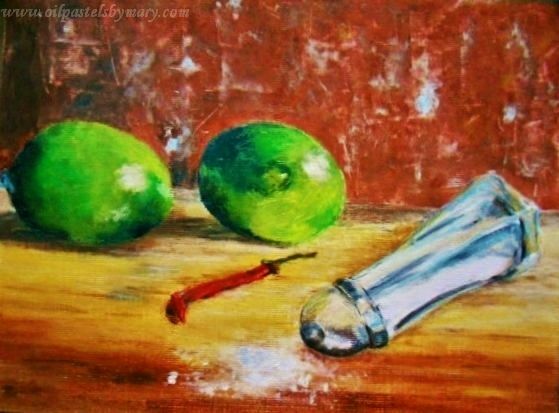 heh, the painting was very suggestive with the toppled salt shaker, leading me to believe your table just might have been between bottles! lol. have a great day Mary! Such a fun style! I love the spice and pizazz. Hi Mamie, thank you! A little bold for me, but was a lot of fun to paint. Your still life paintings have been a delight. I like the addition of the sugar (or is it salt?) shaker on this one. Hi Evelyne, thanks very much for your comments – so nice and really appreciated! You are right, that is salt.